These Spinach Artichoke Taquitos are entirely vegan, gluten free, and easily made from just 4 ingredients. 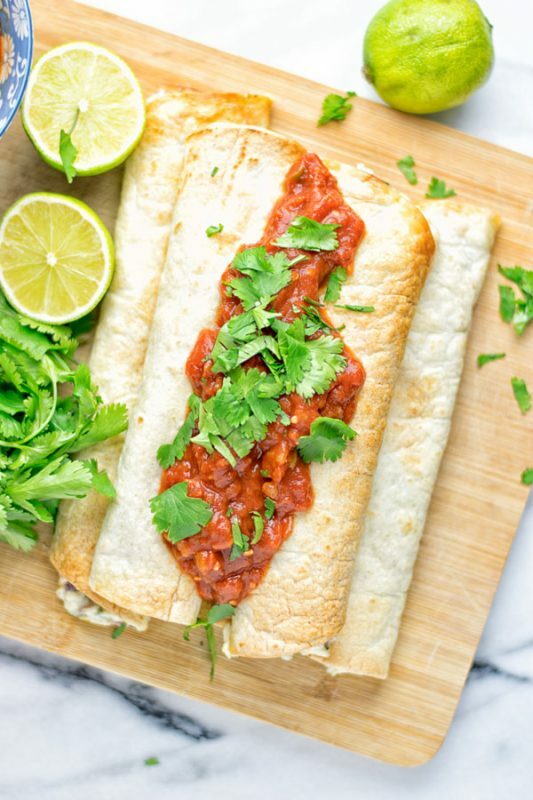 Taquitos are my to go when I want a snack, lunch, dinner, or for parties and movie nights. If you know my Vegan Cream Cheese Taquitos, I know you’ll all love these Spinach Artichoke Taquitos. 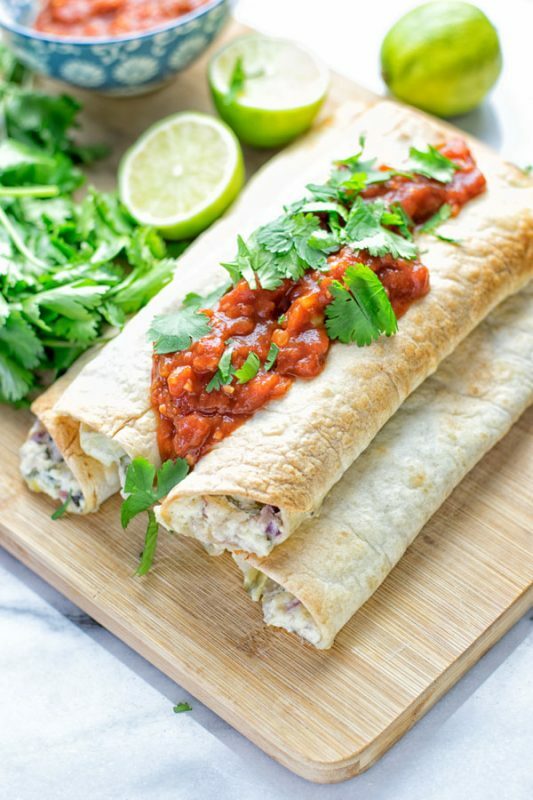 They come with an addictive filling which is creamy, insanely delicious, hearty, flavorful, exciting, baked to perfection in a perfectly crispy baked tortilla from the inside out. Seriously the best. 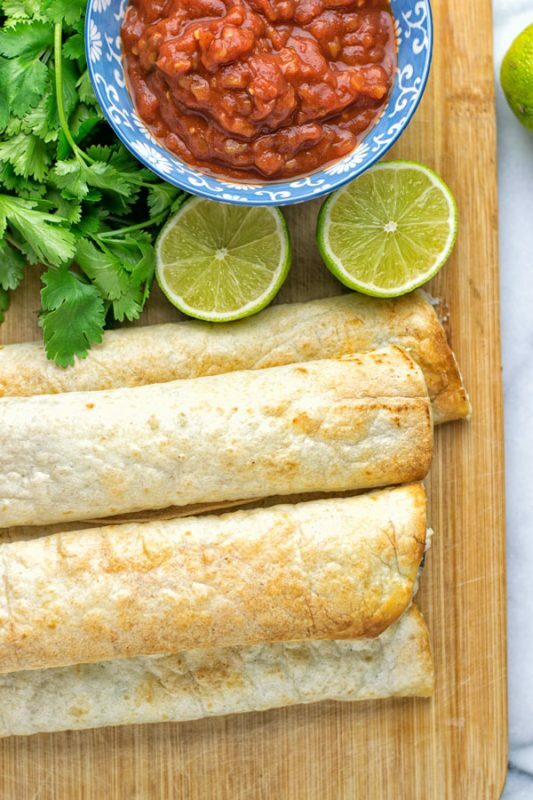 You might think that a taquito is basically the same as a tortilla or burrito. But it’s not. For taquitos you use smaller tortillas as I did here. 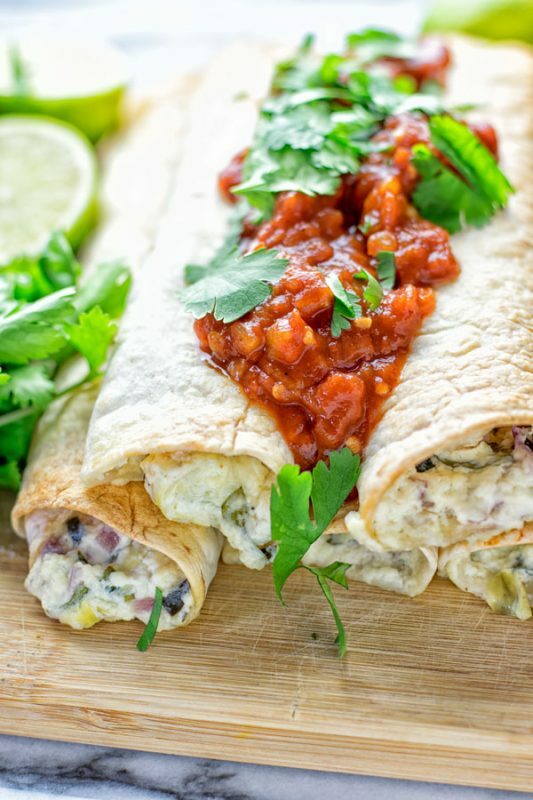 For regular burritos, you will need bigger tortillas. Taquitos are often fried, we bake them. And traditionally, the filling is often made with meat and cheese. We will be making these vegan, of course. Preparation is easy as always. Are you ready? First prepare the Creamy Spinach Artichoke Dip according the directions: mix vegan cream cheese, veganaise, spinach, artichokes and the other ingredients in a bowl, add chopped olives, set aside. In a small pan, fry the chopped onion for 10 minutes with a bit oil. Or make it oil free with a bit vegetable broth instead. After frying add to the spinach artichoke dip. If you use the chopped jalapeño slices (optional) for a bit heat, add them now too. Add about 3 Tbs of the filling into one tortilla and roll tight. You can brush the taquitos with a bit of oil if you like. Bake them on a baking sheet prepared with parchment paper for 15 minutes at 410°F until crispy. 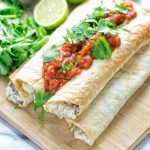 These Spinach Artichoke Taquitos are delicious plain, but you can serve them with with some salsa, guacamole or any other dip you like. It will go with many things. I served them recently on a movie night and they sure impressed everyone. That means I can’t get enough of these, so I made them two more times just for me and friends as well. All friends couldn’t tell these were plant based and dairy free. No one will ever taste it. Also you can be sure no one will ever miss the meat or cheese which are a big part in regular taquitos. I bought my tortillas from a store which were also gluten free, but if you would like to have a new kitchen adventure try this: You only need 1.5 cups flour of choice. Yes any will work, except for coconut or almond flour. If you plan to use one of these, make sure not to use more than 1/4 cup and mix with a different type. Mix with water, 1 Tbs oil, and pinch salt until you have a dough. 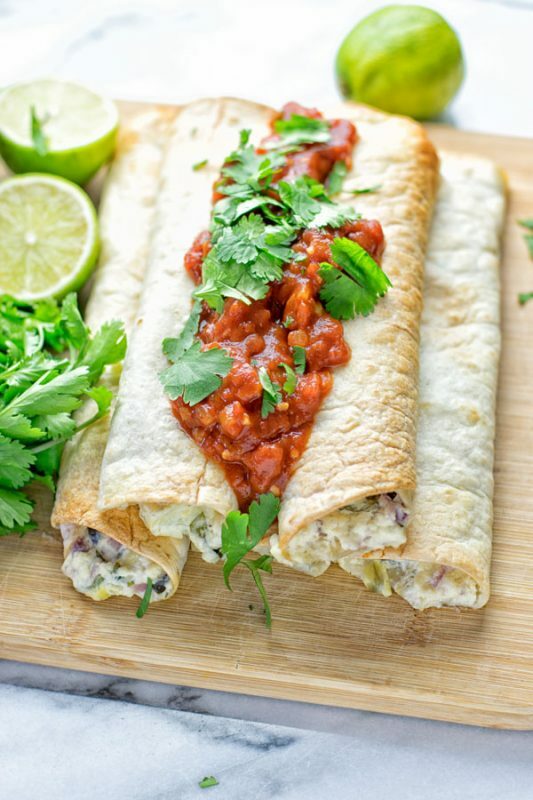 Divide into equal parts depending on the preferred size, but keep in mind you will need small tortillas for these taquitos. Heat a small non stick pan and use oil or vegetable broth if needed. Bake the tortillas in the pan until lightly brown flip, repeat. Spinach is high in minerals like potassium, manganese, zinc, magnesium, iron, and of course calcium. It’s for real a great plant based alternative to get your calcium intake. Also it’s rich in niacin, vitamins A, B6, and C, so it’s full with all the best benefits from the inside out. Another star of the show are artichokes: rich in fiber, vitamins like B6, B12, A and D, as well as minerals like, zinc, iron phosphorus and more. If you give these Spinach Artichoke Taquitos a try let me know what you think on Instagram and Facebook with a tag. Snap a lovely picture and show off. First prepare the Creamy Spinach Artichoke Dip according the directions: mix vegan cream cheese, veganaise, spinach, artichokes and the other ingredients in a bowl, add chopped olives, set aside. In a small pan, fry the chopped onion for 10 minutes with a bit oil. Or make it oil free with a bit vegetable broth instead. After frying add to the spinach artichoke dip. If you use the chopped jalapeño slices (optional) for a bit heat, add them now too. Add about 3 Tbs of the filling into one tortilla and roll tight. You can brush the taquitos with a bit of oil if you like. Bake them on a baking sheet prepared with parchment paper for 15 minutes at 410°F until crispy. What type of olives does the recipe call for- black or green? Hi Laura! I used black olives! Love these! We are new vegans and this recipe is definitely keeping us on track! Thank you! You’re so welcome, Rachel! Happy to help!